14-May, 2014 Fruit Twilight Meeting at Dowse Orchard, 98 North Main St., Sherborn, MA. 5:30 to 7:30 PM. 1 pesticide credit will be offered. Refreshments/snack will be served. Orchard walk, current orchard management updates. $25 meeting fee ($20 for MFGA members.) Contact: Jon Clements, 413-478-7219. Pre-registration is not necessary. 21-May, 2014 Fruit Twilight Meeting at Alyson's Orchard, 57 Alyson's Lane, Walpole, NH (www.alysonsorchard.com). 5:00 to 8:00 PM. 2 pesticide credits will be offered. Refreshments/snack will be served. Contact: George Hamilton, 603-641-6060. This time of the year is pretty overwhelming. Weather issues. Equipment shake-out. Tree planting. Apple scab? Assessing winter injury to peach flower buds. On apple scab, we may (or may not) have had our first official infection period with enough green tissue to worry about in the last day. If you had a very clean, scab-free orchard last year, no worry. (Ascopsor maturity very low and not too much green tissue. 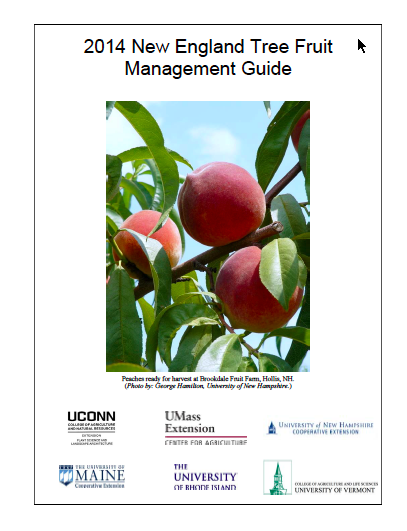 BUT, if you had a lot of scab at the end of last season on foliage, I would be concerned and if you did not have a good copper or other fungicide on before the recent wetting, I would consider applying a fungicide with some kick-back (see 2014 New England Tree Fruyit Management Guide) as soon as the wind dies down. NEWA for Belchertown indicates we did have an infection period with 8% ascopspore maturity. Dan Cooley, Arthur Tuttle, and myself are in the midst of evaluating four different sources of scab models, it's a bit overwhelming, but we have some real good applications now for assessing the apple scab situation on a site-by-site basis. Stay tuned. 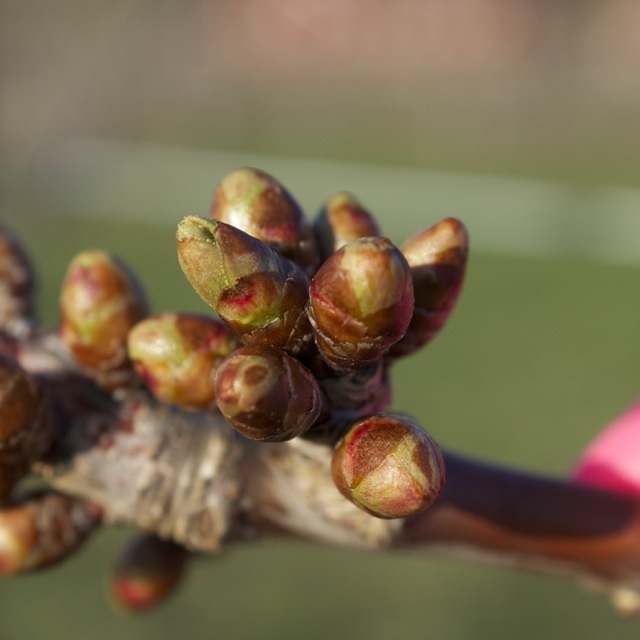 Regarding winter injury to peach flower buds, what are you seeing? 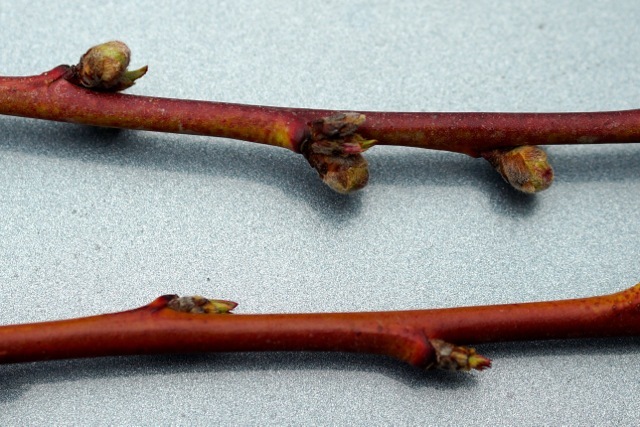 It's easy to tell now if flower buds are damaged, as you won't see any swelling or 'pink.' Unfortunately it appears to have gotten cold enough in January to do some damage to some orchards. See picture below. A lot depends on site (just how cold it got, anything less than -10 F. spells trouble) and variety. I would be very interested in hearing if you are seeing a lack of swelling buds. Peach shoots collected 4/22/2014 in same orchard, adjacent row, two different varieties. Top shoot has viable, swollen peach flower buds. Bottom shoot had non-existent, dried-up flower buds that were likely damaged by mid-winter cold temperature of -10 F. or below. Winter damage is highly site-dependent (how cold it got) and variety-dependent. One of the important characteristics of a tall spindle apple tree is numerous lateral branches or feathers. All too frequently trees come from the nursery with inadequate lateral branches (i.e. akin to 'whips') and during the first year in the ground equally frequently few are produced. There is something that you can do to improve the potential bearing surface on these trees and now is the time to do it. Notching is a technique that involves cutting through the bark above a bud down to the secondary xylem (wood). We have found that making a notch above buds with a hack saw blade is effective and rapid. A cut above the bud extending about 1/3 of the way around the stem is appropriate. The time to do this is between 6 and 2 weeks before bloom. The second method is to apply 350 to 500 ppm Promalin or BA (MaxCel). I do not recommend using Promalin since it will inhibit flowering for next year. BA will not affect flowering. Either technique can be moderately successful but if they are combined a much higher percent of branching will be possible. 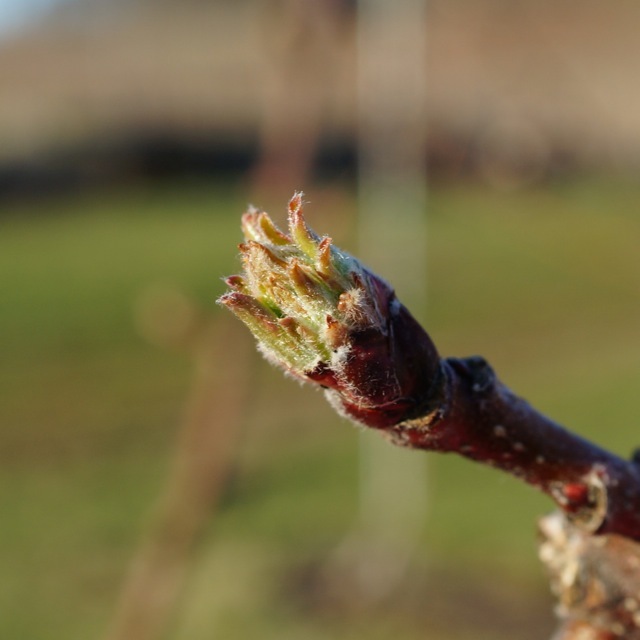 Now is the appropriate time to notch buds. We suggest that you select appropriately spaced buds and notch them as soon as you can. Notching several buds on a tree can be done with a hack saw blade and it requires no more than about 30 seconds per tree. The larger the bud that is notched the greater the chance that the bud will break and grow into a short branch. Previously, we waited to apply the MaxCel until some leaf area emerged to improve absorption of the BA. Work by Steve McArtney in North Carolina showed that application of BA immediately after notching was effective as well. We suggest that a rate of BA of about 400 ppm is appropriate and this rate should be used. Apply MaxCel after notching or up to about 2 weeks after notching. As always, we suggest that you leave at least five trees untreated so that you can assess just how well this treatment worked for you in this orchard. Especially for insects, the overwintering stage affects how quickly a pest can begin attacking your crop. If it is in the adult stage, it may be ready to feed, or lay eggs right away. If it overwinters in a different stage, then it usually takes longer to become an active threat. 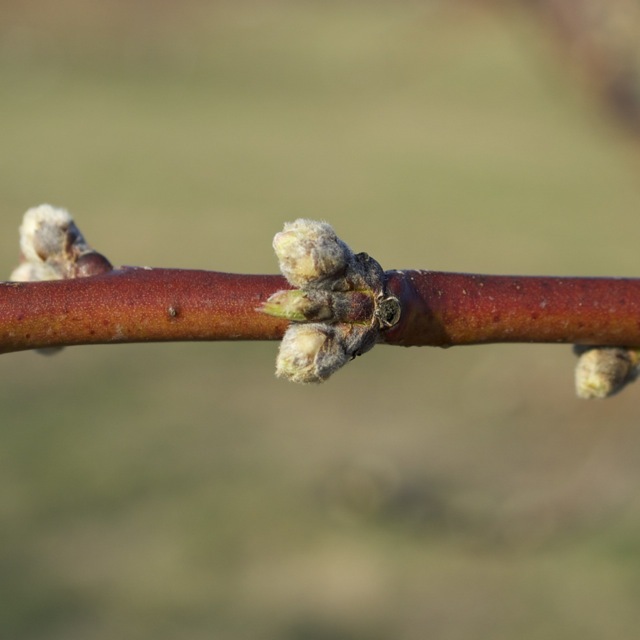 Tarnished plant bugs and pear psyllas overwinter as adults, and are ready to attack your fruit trees as soon as the weather warms in the spring. Typhlodromus pyri (predator mites) overwinter under scales of bark near the base of fruit tree trunks. They begin activity after the buds have opened and weather warms. I expect their numbers to be low this year, from the long, cold winter. Apple grain aphids (AGA), European red mites (ERM), and Eastern tent caterpillars overwinter as eggs. AGA hatch and start feeding on the opening apple buds right away, but are not a problem. ERM eggs usually hatch during the pink stage of apples. For years, tent caterpillar eggs hatched on or about April 15th in southern NH, but in recent years that has shifted earlier. We’ll see if it is back to April 15th this year. Plum curculios are still in leaf litter in the woods. It will be late May or June before they become active. Codling moths overwinter in cocoons the caterpillars constructed last fall. They are usually on the trunk, well camouflaged in bark crevices. The caterpillars that survive the winter transform into pupae in the spring. The adults emerge in June. Green pug caterpillars are a problem for some growers during bloom. They overwinter as eggs that were laid on the buds last year. 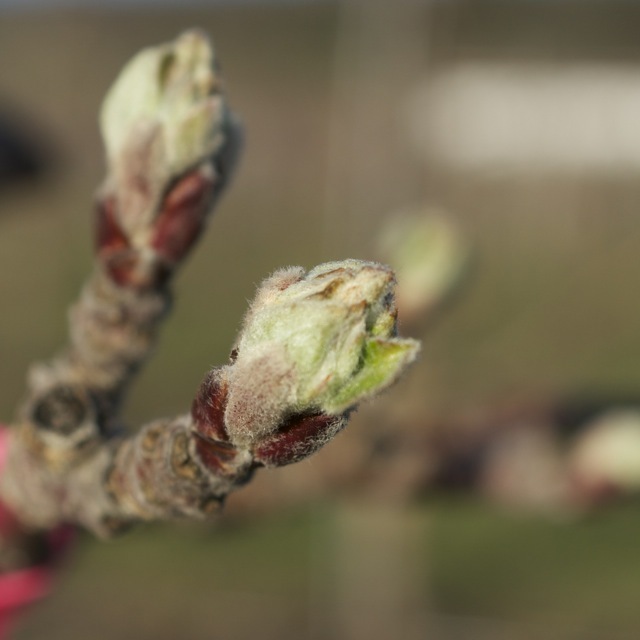 The eggs usually hatch in April, when new apple foliage emerges from the buds. I do not know how sensitive they are too cold winter temperatures. Since they are exposed, maybe fewer of them will survive than usual this year. Tentiform leafminers are in the pupal stage, in mines in dead apple leaves on the ground. The adults emerge starting at about ½ inch green stage. Fungi: Understanding how & when the fungal pathogens overwinter helps us understand where sanitation might help, and when attack might begin. Apple scab fungus overwinters in last year’s dead leaves. Over the fall and winter, inside the leaves, the fungus produced perithecia which are now filled with sacs containing the ascospores. As spring advances, the ascospores mature. When daytime rains fall, the mature spores get released. In New England, North American brown rot fungus overwinters in cankers. The fungus produces conidia in spring, which are splash spread. The European brown rot fungus (Monilinia laxa) overwinters the same way here. Farther south, North American brown rot fungus also overwinters in mummified fruit. The fungus can produce apothecia from mummies on the ground, if conditions are right. Mummyberry fungus overwinters in last year’s mummified blueberries, on the ground. 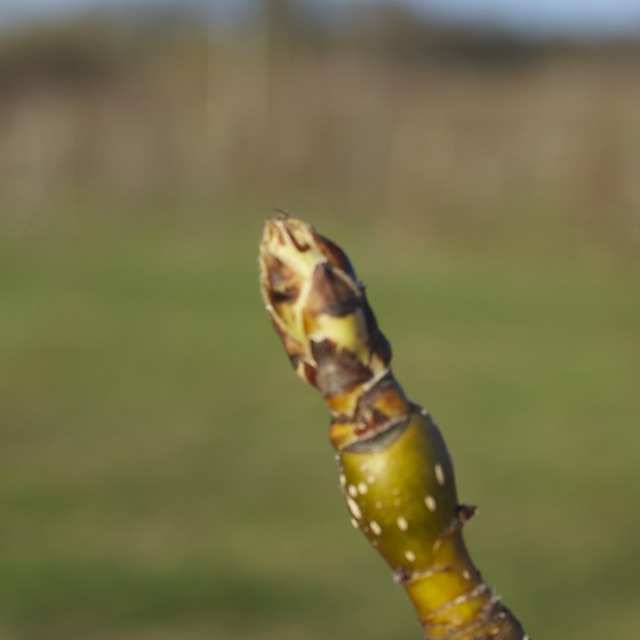 When the blueberry buds open and green tissue is available to attack, the fungus grows a stipe out of the old berry. It opens into a cup, and releases ascospores during rainy weather. Michigan State University Extension educators and growers around the state reported higher than normal San Jose scale numbers on apple fruit in bins in 2013. Dormant oil is an effective method to control San Jose scale and should be considered for use in 2014 if the weather and growth stages are right. The term “dormant” in dormant oil can be a little misleading as the more commonly used timing is delayed dormant, or as close to green tip as possible and up until the pink stage. Keep in mind that oil and green tissue are not very compatible. 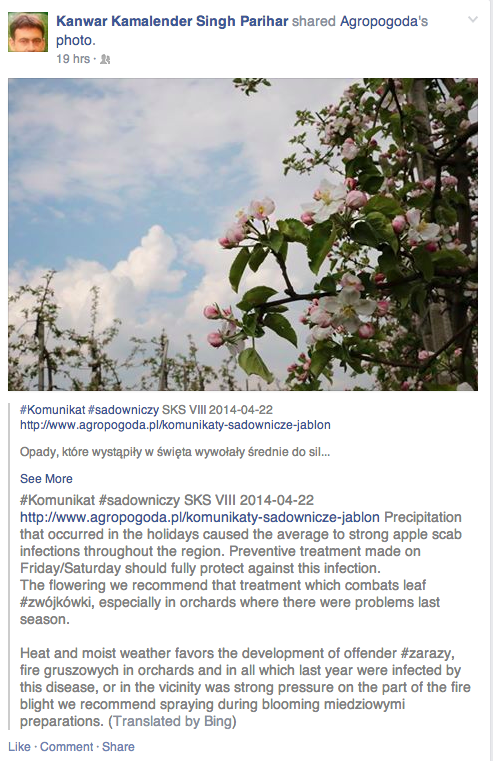 Phytotoxic damage to buds, blossoms and fruitlets is possible, thus care must be taken to avoid weather extremes. Do not use oil sprays 48 hours before and after a frost event. Avoid using oils in very hot (over 85 degrees Fahrenheit) and humid conditions. Good coverage is important for all spray applications and especially when using oil to target San Jose scale where the treatment target is on and under bark scales where the overwintering scales are. A common way to use dormant oil is 2 gallons/100 at 100 gallons of water per acre at green tip with copper. Some growers will break up their oil applications into two sprays: once at green tip with copper and another at 1 gallon/100 at tight cluster with Lorsban. Rates need to be reduced as the oil is applied closer to pink. Spur and bud damage is a high risk at pink and should be down to no more than 1 gallon oil/100. Late applications will offer the best help to control scale and mites and adding Lorsban or another insecticide will help control rosy aphids. Different crop protection retailers have different products and they all work similarly. Be sure to work closely with your spray salesperson for the best recommendation and use of their products. Dormant oil needs to be applied with care and attention to the weather conditions before and after the application. The next Healthy Fruit will be published on Tuesday, April 29 or thereabouts, 2014. As always feel free to get in touch with any member of the UMass Fruit Team (http://extension.umass.edu/fruitadvisor/team-members) if you have questions or comments.